If you want to see true power in action, you need to see the BL-7000SLX hoist a Chevy pickup in only 30 short seconds. It's not just that QuickJack gets trucks in the air quickly that impresses virtually everyone, it's how stable, how fast and how smooth QuickJack works. In order to eliminate obstructing cross bars seen on other lifts, this fully electric-hydraulic system is demandingly engineered with reinforced steel frames, as well as a built-in flow restrictor to regulate the pressure output of each frame's cylinder. The end result is unprecedented portable lifting perfection. The BL-7000SLX is our highest-capacity standard length lift. If you need longer frames, we also make EXT (extended-length) lifts in 5,000 and 7,000-lb. capacities. 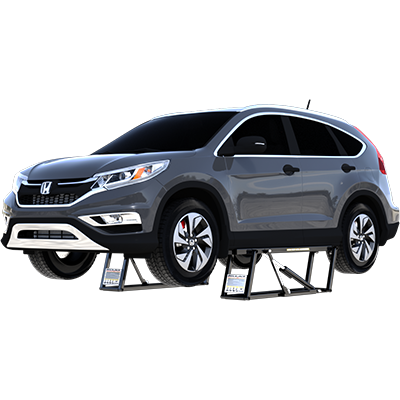 With QuickJack, it's never been easier to put the perfect car lift in your home or shop.